When it comes to preparing for a new baby, you may find yourself overwhelmed with all the stuff that babies require. Before my daughter was born, I was fortunate to receive lots of hand-me-down clothes from friends and family. Not only did I inherit the smaller sizes I needed, I also acquired larger sizes that would fit as my daughter grew. I was excited not to have to worry about finding clothes to fit my daughter as she grew out of infant sizes but I had to find an organized way to store them. I purchased two large totes and separated them by season (which I’ll explain below). If you find yourself swimming in piles of children’s clothing, I would definitely recommend grabbing some totes in order to store them away, instead of trying to fit larger items into drawers and closets. You’ll want to, of course, keep out newborn to size 1 clothing items. The rest can be stored away and, instead of simply dumping everything into one container, you can sort them by size. Have a tote for size 2-3, one for sizes 4-5 and another for anything larger. As your little one grows out of a size, you can simply pull out the next tote and replenish their wardrobe. When I started to organize all those clothes, I initially began size piles. The problem I ran into was, much like adult clothes, not all baby clothes sizes are created equally. Some size ones appeared as large as size two and a few size threes looked like they could fit an infant. There were so many adorable outfits in larger sizes that I didn’t want to risk pulling them out when my daughter fit a size 2, for example, only to find they ran small. What I did instead was divided the clothing by season. There was a pile for Spring and Summer and well as one for Fall and Winter. Then, as one Winter and Summer came to a close, I would haul out the next tote and go through the sizes. Once I determined which clothes would fit my daughter, I packed the rest away. I loved this system so much, I ended up packing away my own seasonal clothes! Not only did I alleviate the mass of clothes in my dresser and closet, but every season change I felt like I was acquiring a new wardrobe! Being able to put away clothes you don’t need is great, but what do you do with the clothes your little one is currently wearing? 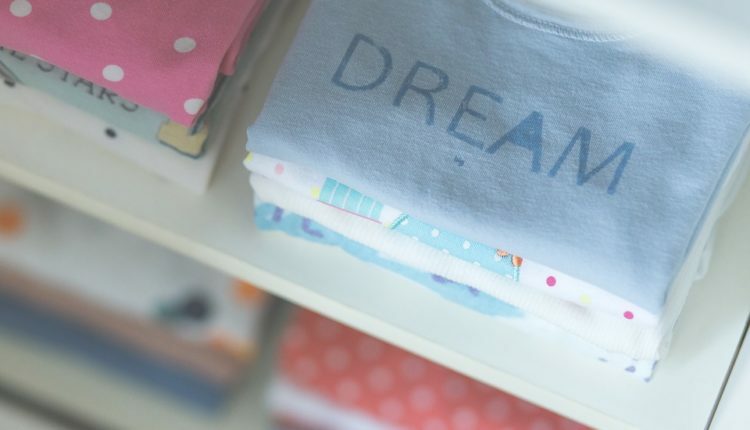 While the simple answer seems to be to merely shove them in a dresser, as a new mom you will soon understand the value of organization when it comes to saving time and being to do things quickly. If you have some closet space, hanging baby clothes is, visually, the best way to organize clothes. Once hung, you can clearly see everything available for your child to wear. To make closet-use easier, you can save space by hanging 3 onesies on one hanger by clipping the buttoned crotch area to the hanger. And when it comes to hanging pants, you can use clothespins to attach them to the hanger instead of trying to hunt down tiny pants hangers. Hanging clothes in a closet can be time consuming, so you may opt to place your little one’s clothes in drawers. However, as you begin digging through outfit options, you may find the drawers turning into a tornado aftermath. You can purchase plastic drawer organizers to keep items in place, or use sturdy cardboard to separate clothing items. Try to revamp your folding style by rolling the clothes or folding them in a tuck-style. The tuck-style is perfect because as you dig through shirts, nothing will come unfolded. A cloth or plastic shoe organizer that hangs over the back of a door can be the perfect storage area for onesies, bibs, socks and cloth diapers. You can even use one to plan day-to-day outfits.